My trip to Israel began at my building at 108th Street and Riverside Drive. 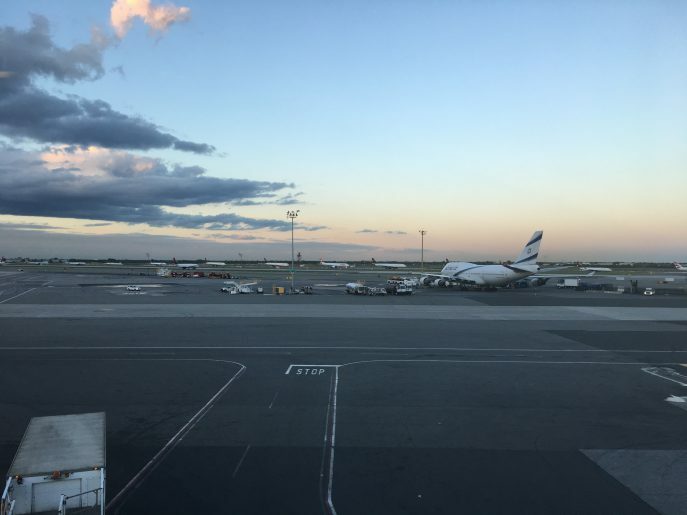 I had plenty of time before the 6:30 pm flight so took the subway: first the #1 train to the B at 59th Street, then a change to the E at 7th Avenue, and finally the JFK Air Train at Sutphin Boulevard. All typically New York so far, with many different types of people including a young couple from Moscow on the E—all in a system that moves quickly but cannot be described as clean or attractive, excepting perhaps the Air-Train. It was midday, and not too crowded, and I had a nice conversation with an MTA employee who clarified my transfers. Then at Kennedy’s Terminal 4, a helpful young woman, directing passengers, told me that that I was too early for El Al check-in and placed me at the beginning of what became a long passenger waiting line. 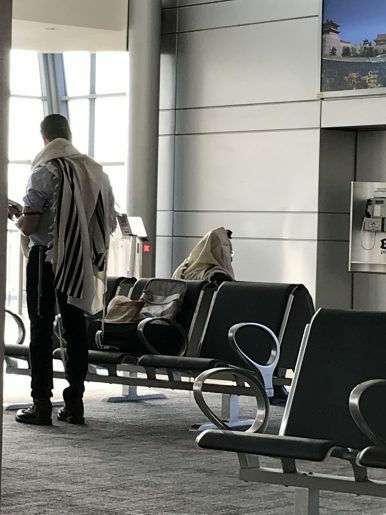 The crowd was eclectic—a number of older American couples traveling to the Holy Land, by their look Christians, mostly white some black from the continent’s interior—and a number of Israelis. I had a pleasant conversation with an older Israeli who was directly behind me. She frequently visits her son and grandchildren in Cleveland and was on her way home. The food she said is not good in Cleveland, so she did a lot of cooking, but her grandchildren are learning Hebrew as their mother is a Hebrew teacher. She is round, casually but carefully dressed, with hair too-perfectly-set against an elderly face, and she is warm and genuine. Her antecedents were from both Europe and Syria, an unusual blending for Jews in the United States. Why are you visiting? I’m seeing friends and cousins. Do you celebrate the holidays? Passover, with a shrug that indicated some of the time. What are your cousins’ names? These were given. Do you know anyone in the surrounding countries? I have a Palestinian American friend who visits her family in Jordan. How often do you see her? Every few months. When did you most recently see her? A few weeks ago. All very friendly, but she spoke clearly and with authority. She then walked me over to the ticket agent, an American, and waited a few moments while the agent began to check me in. The ticketing, but not the security, is delegated to local ground staff. At the gate I was early, so it was quiet for a while, but soon there was an animated and interactive crowd that was surprisingly religious, including Americans and Israelis. At about 5 o’clock a number of men, seemingly unrelated to each other, some in kipa, others in the black suits and fedora of the more orthodox, gathered to face a large east-facing window, praying, with a series of shallow bows known as davening. 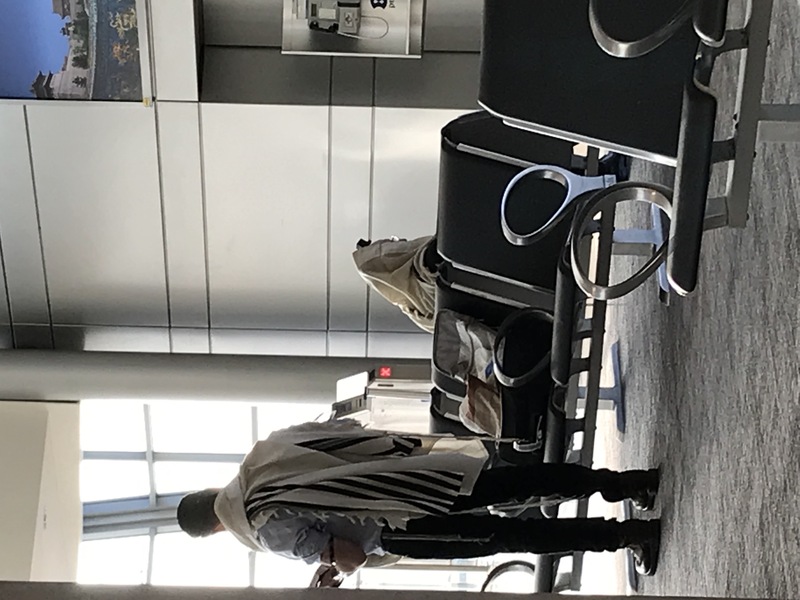 I had seen this before, but now I was moved, among Jews and in Israel, well before boarding. On the plane, a young American mother with a baby and her sister asked me to switch seats with a third young woman behind me, so that they would not be sitting next to a man. She later found an empty aisle seat, elsewhere on the plane and then asked the third young woman to move to that seat, so that she and her sister could better manage the baby. The mother was friendly, not insistent, but without embarrassment for these requests. Her daughter, reddish-blond, round faced, and two years old, was charming, happy and interactive. The mother entered the plane with her head uncovered, but later put on a head scarf. Her sister, perhaps twenty, was very beautiful–in her face, figure, movement and extraordinary golden hair. Her modest clothing did not conceal her looks. Meanwhile to my left, two young Israeli men barely said a word and did not get up once, during the entire 10 hour flight. As is occasionally the case around straight men and beautiful women, I seem to be doing all of the looking.